Anybody taking a stroll in one of Singapore's parks or nature reserves would soon be intrigued by the shrill screeching whine that seems to follow one's every step and move. 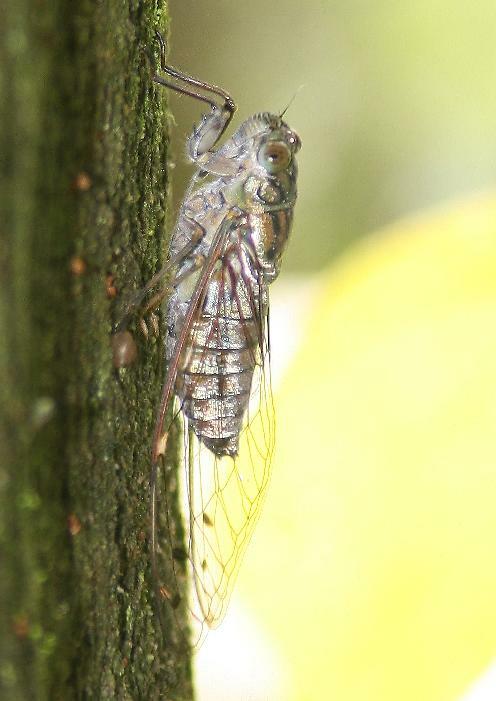 This strange sound is produced by the male cicadas in their effort to attract females. 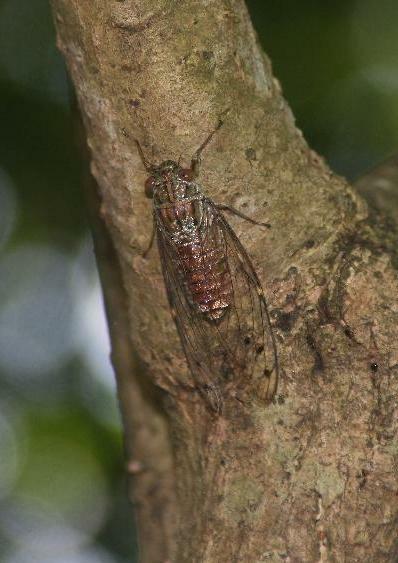 Almost perfectly camouflaged with their brownish body, cicadas blend in nicely with their surroundings and are very difficult to spot despite their rather large sizes of between 3-5cm, depending on the species. 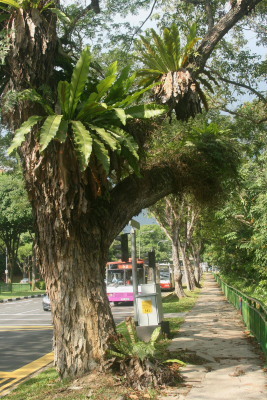 Epiphytes are a typical feature of a tropical rainforest and a common sight on roadside trees in Singapore. They attach themselves to a host plant in their quest for sunlight but do not receive nutrition from their host. 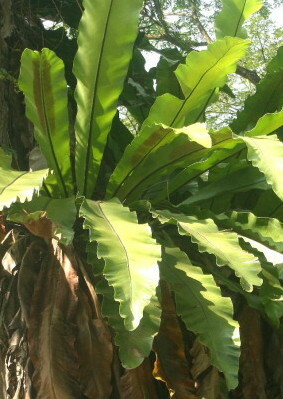 One of the most conspicuous is the Bird's Nest Fern with its lush green leaves. Their funnel-like arrangement helps to collect rainwater and dead leaves that decompose in the center and provide the nutrients the plant needs for its survival. 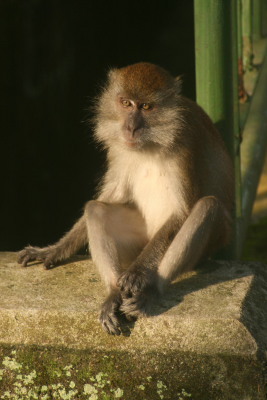 The best spots to observe monkeys and their antics are in the Central Catchment Area around the MacRitchie Reservoir or the Lower Peirce Reservoir, as well as the Bukit Timah Nature Reserve. 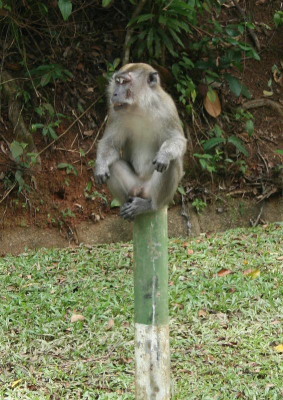 But be warned: no thanks to irresponsible visitors, monkeys have learned to associate plastic bags with food and can become pretty aggressive when they see anybody carrying a plastic bag openly. 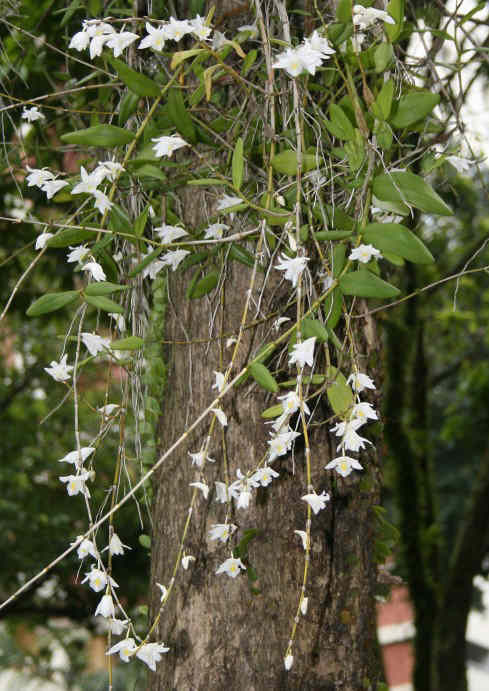 This wild orchid is an epiphyte like the Bird's Nest Fern. Altough common on wayside trees, Pidgeon Orchids go largely unnoticed. 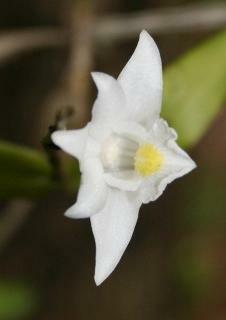 The shape of their delicate white flowers resembles that of a pidgeon, hence the common name. The flowers have a strong fragrance but last only for a day or two. Every couple of months and triggered by a localized drop in temperature, all orchids in that area spring into bloom simultaneously.